In 2004, production began on what was supposed to be the greatest modern car documentary. 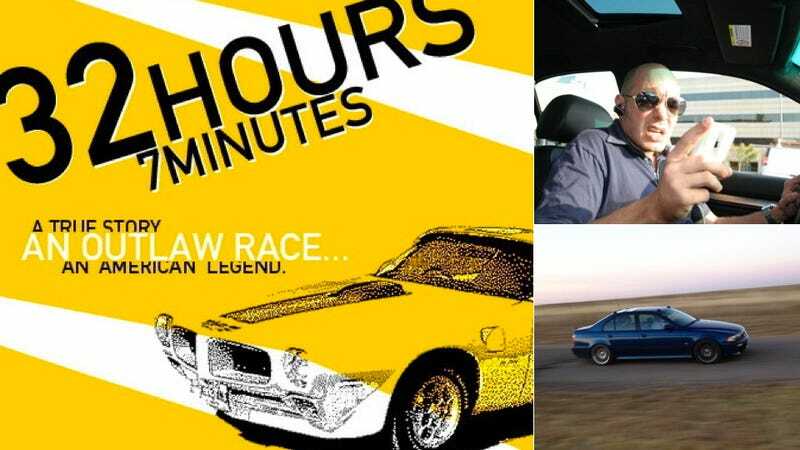 32 Hours 7 Minutes was intended to tell the stories of the record breakers of the US Express cross-country races of the 1980s while adding a modern element: Alex Roy's world record drive across the USA in a BMW M5. The US Express racers said their record couldn't be broken. Roy and codriver David Maher beat it by an hour. But the movie was never released. Now, litigation is flying between Roy and his production partner, Cory Welles, as she brings a version to limited DVD release without any input from Roy. Here is a free lesson in how not to release a film. Before Roy and Maher set out on their cross country runs, Roy was approached by Cory Welles to make a documentary about the attempt that would tie in with Welles' knowledge of the 1980s US Express races. It had all the ingredients to become a modern classic. Roy, who is friendly with many current and former Jalopnik staffers, says he agreed and provided funding for the project. He also would receive an Executive Producer credit for his involvement in the film. The timing couldn't have been better as Roy had just released his book, The Driver, soon after the cross country drive and did the talk show circuit. David Maher, Roy's codriver, tells us that he believes the original intention was "to release the 32 Hours 7 Minutes soon after the book, and Alex would use his marketing genius to build buzz." But no movie has been released in the six years since production ended. There have been numerous drafts and edited versions, as well as promises of a release, but nothing has become available to the public. We have been told that Welles no longer speaks to anyone that was involved in the 2005/2006 record attempt, a.k.a some of the stars of the film. The limited release DVD that is now coming out has had all mention of Roy as producer and participant removed from the DVD case, even though he is still listed on the movie's Facebook page as a producer. Roy did not receive a copy of that film. Maher, who has no money invested in the film, told us that the "fact that Roy's name isn't on the movie is ridiculous." We tried to get Welles to comment on this article but she delayed multiple times. I have been informed that there is a version of the film "32 Hours 7 Minutes" scheduled for imminent release by Gravid Films and Cory Welles. This version was not reviewed, approved or endorsed by me. In October of 2012, my attorneys filed suit against Ms. Welles, 32 Hours 7 Minutes LLC, Gravid Films, and others, alleging negligence, malfeasance and breach of contract. I was notified of Gravid's decision to release the film and believe that this release, scheduled after years of inactivity, is simply an attempt to answer some of the claims that are being litigated. I remain committed to my loyal fans and supporters and will continue to work to make sure that they receive only the best product that reflects my commitment to and passion for of the open road. We have heard that the version that is now available on DVD (We will be receiving a copy soon) is quite similar to all the rough drafts that Welles has done before, but with added voiceover. This has been her life for nearly a decade, and I can understand why she wouldn't want to give it up. But by my estimates, she's re-cut this film about six times. There is a point at which you can no longer be associated with the edit of a film when you know the content too well. It is actually quite sad. She's too connected to it - she can't give it up - almost like an obsession. When I worked on it, she was in the mindset of trying to squeeze as much as she could into 120 minutes. That's one reason why the prior cuts failed — they didn't tell a story — they were just a mashup of everything she wanted. As Maher told us, this was "always Welles' movie and Alex helped financially." The cut that is out now is believed by some involved to be a rush to beat Alex's lawsuit. "It's a disservice to Alex, Cory, and everyone in the movie" according to Maher. Welles has also elected to release the film on DVD and there is speculation that she may be looking to make back the money spent on the production through taking people who pirate the DVD to court, but we have no proof of this. Roy has distanced himself from the film quite publicly, issuing the same statement on his Facebook page as he provided to Jalopnik. It has gathered hundreds of likes, as well as people asking on the official 32 Hours 7 Minutes Facebook page to explain what is going on and why one of the stars would not want to be associated with his own world record run.